So die cutting machines. Yes there are a ton of them. I have a few different ones myself. However, today we are talking about the Slice Elite by Making Memories. Come with me and explore why this is or is not the machine for you. Ease of Use: This is by far the easiest die cutting machine out of the box that I have ever used. Just plug it in, hone blade, select cut mode and speed, put in cartridge, select image and size and push start. Construction/Durability: This machine is very light weight but by no means cheaply made. If well cared for, should last you a good long while. Usefulness: As far as usefulness goes, this has many functions. Not only does it cut dies, but it also embosses. It cuts through many things: paper, thin vinyl, cardstock and even fabric when backed with fusible web backing. Cost effectiveness: This is a bit of a struggle for me. It retails at $149.99. It comes with one image card, so if you want more images you will have to purchase more cards. Along with having to continue to buy more adhesive for the cutting mat it can add up. -It cuts fast and very clean when used with the hands free kit. -Super easy to use. No rocket science required. -Just the ongoing cost of this machine. However, you get that with other die cutting machines as well. -You are confined to the size of cuts. It ranges from 1" to 4" in only 1/2 inch increments. Bottom Line: If you want this machine, it is a must to have the hands free kit as well. Using the kit gives a cleaner cut when used with it than it would without. The Slice Elite is great in portability and size. What do you think? What are your thoughts? Is this machine for you or no? Let us know! 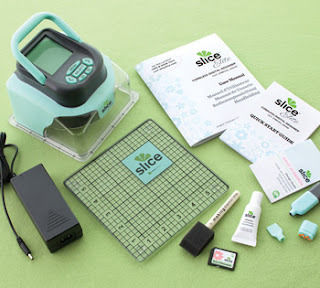 I would love to try the Slice Elite, but like with any die cutting machine I don't want to have to constantly invest in carts. I have a Cricuit that I've used twice and I only own 3 carts, so I just can't see myself investing in a Slice right now even though I've been very impressed with what I've seen and heard about the machine! Thanks for this insightful review! I am struggling with the die cut revolution going on. I love the look and wonderful things people make with die cutting machines. But the initial cost is a lot and it seems like you really don't get that much without a lot more money invested. And cartridges cost so much for such a small amount of things to cut from each one. I don't know, I'm still on the fence about them. I do like that this one is smaller and more portable. Storage could be done in a little plastic box instead of some of the larger ones that take up more room on the desk. I'm a big fan of Making Memories but as Ashley mentioned, "it is a must to have the hands free kit as well," i.e., why doesn't MM sell it that way if it's a necessary part of The Slice? I'd love to give it a go ... it looks so fun to create with!! I have a slice that I got when they first came out. I use it more now than I did when I first got it. It is small, easy to take to a crop and if you own enough cards then you have plenty of images to give your projects dimension. I do have quite a bit of trouble with my blade and how it cuts but with patience I can work around that. I have heard nothing but good about the Slice Elite, especially about the cutting blade (not having to do any adjustments to it) but the price of it is stopping me of upgrading. I have the Original Slice and it was 'okay'. I liked it but not TICKLED with it. Then I bought the Slice Elite. L-O-V-E, love it! Big improvement. Cleaner, more sharper cuts. No matter what Slice machine you have, the hands-free kit is a MUST! Without a doubt! The cost of the cards are okay, but I do try to find a sale when buying. VERY happy with my Elite. I agree on the price of electronic die cutting machines as a deterrent. I fought buying one, but then five months ago I won a Cricut machine and five cartridges. I personally need the larger die cutting machine to cut cupcake boxes, shape cards, and treat boxes that are large enough. The small Cricut and the slice would not work for my needs. My only critique of the circuit is cutting at 1/4" increments. I would prefer 1/8", so this would also prevent my from buying a Slice. Two big plusses for the slice are the size and ease of use! I don't own a die-cut machine so I appreciate the review. I really am not certain if a die-cut machine is for me or not but I know I wouldn't want a really big one so the size of this is appealing. 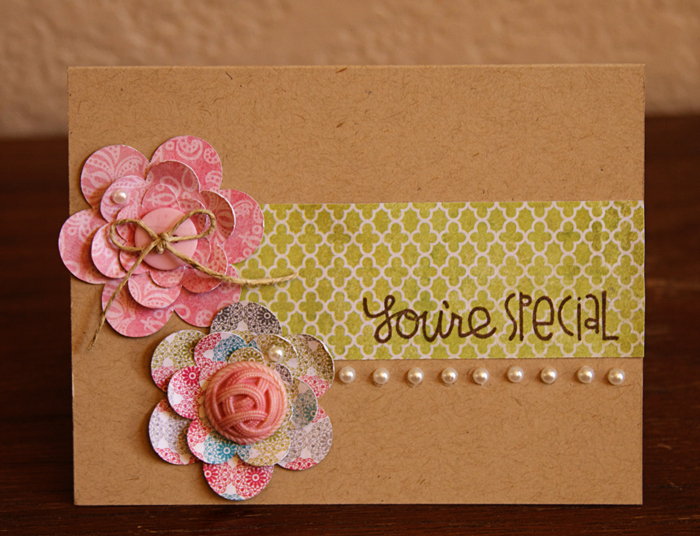 Love those gorgeous flowers on your card. I have wanted a Slice but the cost has kept me from buying one. Would love winning one, but then who wouldn't? I've actually thought about this little guy for quick-and-simple card or art projects, but the cost is definitely prohibitive for a "also can use" machine in the craft room. As for the review, maybe a future review (review point two, ha ha) could include some machine-to-machine comparisons (such as cutting letters on paper stock, vinyl, etc., in similar sizes on this machine vs. Cricut). LOVE the card Ash! Though the idea of a hand held cutter sparked my interest, I think I will just keep my Silhouette.